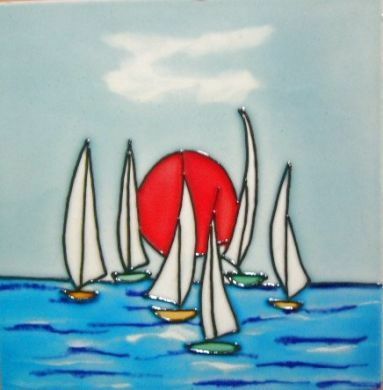 A hand painted ceramic picture tile with a colourful and well painted sailing scene. It is one of a set of similar sized tiles with a Mediterranean theme which together would look fabulous set in a tiled area such as a shower. 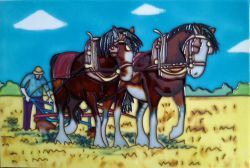 It can also be hung on a wall as a picture or displayed as an ornament in a stand. The tile is supplied inside a presentation box, with a black felt covered backing and a hanging hook both of which can easily be removed if the tile is to be fixed to a wall. This item can be Gift Wrapped, complete with Gift Tag to include a personalised message. Please select GIFT WRAP from main menu.